Oh no, sounds like it's all getting too much for you! Even though you have done the wrong TWD recipe, you are still ahead of the game for next week! Your bread looks and sounds delicious! I'm with you all the way in having things organized. The bench looks like it would be great. I had something similar years ago when the boys were young and it was wonderful for keeping things accessible but "put away." Good luck in your endeavors! I have a rice cooker, but that is because I grew up with one as a staple :) I can't even conceive of cooking rice on the stovetop, haha. I know you can do a lot of other things in a rice cooker (or a pressure cooker, which is what my mother has upgraded to), so I think it would be worth it. Or you could just get a cheap little one that just makes perfect rice every time! your bread is so pretty! a work of art. i know what you mean about the toys etc. Toy storage is always an issue. How, Where, etc. My rice cooker was a wedding gift 37 years ago and it still works beautifully. I use it lots and not just for plain rice. If you want good rice - get a cooker. Your bread looks great! I can't wait for next week's recipe--is it fabulous?? I think I'm in the minority, but I don't like rice cookers. I always cook mine stovetop, and have perfected the art of getting a golden brown crisp layer on the bottom without burning it. That's my favourite part, and can't be replicated in a rice cooker. "every nook and crazy" that is hilarious! I wish I'd have thought to use up the 1/2 cup of cinnamon chips I have left in the cinnamon rolls I made with this bread recipe last week. Ugh--toys, the bain of my existence! ;) Especially as I finish packing and we move on Friday. Good luck with your organizing adventures. I love cinnamon chips too! I add them to so many things! Your bread looks amazing! Your bread looks amazing! I didn't make last week's recipe, but now I'm rethinking that. Looking forward to reading about your mango sorbet. Sounds refreshing! If you ever find a way to manage all of the toys, please let me know because I want that secret! I'm with you on the toy issue. Ever since my second kid came along, they have exploded. We are making do with some IKEA bookcases and baskets, but they keep escaping. We are moving in a month and I secretly wish about half (maybe more) of the toys would conveniently fall off the moving truck. But about that bread...it looks soooo good! Gosh, Anne, I sure can sympathize with you. I remember well those days of toys all over the floor. My husband used to say it was like we were living "in a clown house"! Sounds like you're making progress trying to get it all under control. In the meantime, though, you're still baking the most beautiful stuff! 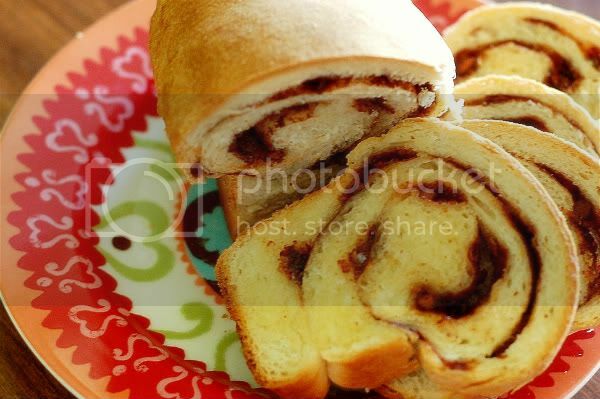 Your cinnamon chip bread looks absolutely fantastic. Very pretty bread and I just have to say, "YES!" to rice cookers. I love ours. It's so nice to just fill it up, turn it on and there you go!